I absolutely love this recipe! I make them every weekend and my family can't get enough! PREHEAT oven to 350° F. Grease and flour 8 x 4-inch baking pan. COMBINE flour, sugar, baking powder and salt in large bowl. Beat eggs, evaporated milk, oil and lemon zest together in medium bowl. Pour egg mixture into flour mixture. Stir until just combined. Pour into prepared pan. BAKE for 55 to 60 minutes or until wooden skewer inserted in center comes out clean. Using the skewer, poke numerous holes in the hot bread, piercing all the way to the bottom. Slowly drizzle the hot Lemon Syrup over the bread (Syrup will soak into the bread). Cool on wire rack for 15 minutes; run knife around edge of bread. Remove bread to wire rack to cool completely. 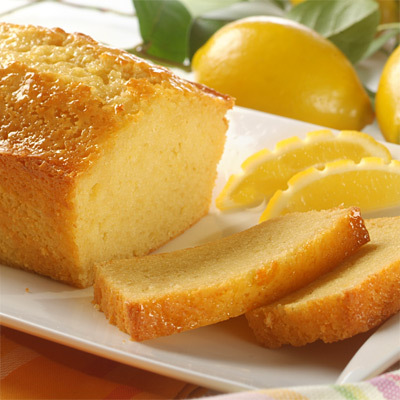 COMBINE 1/3 cup granulated sugar and 1/4 cup lemon juice (1 lemon) in small, heavy-duty saucepan. Cook over medium-low heat, stirring constantly, for about 5 minutes or until sugar is dissolved and a light syrup is formed.